Up to a maximum of 6 heart pendants can be mounted next to each other. Color table and font selection can be found in the product photos. The arrangement of the Hearts is done according to your specifications, e.g. Up to 6 heart pendants can be mounted on this door sign. We are also happy to design wildcards if the family planning is not yet complete. 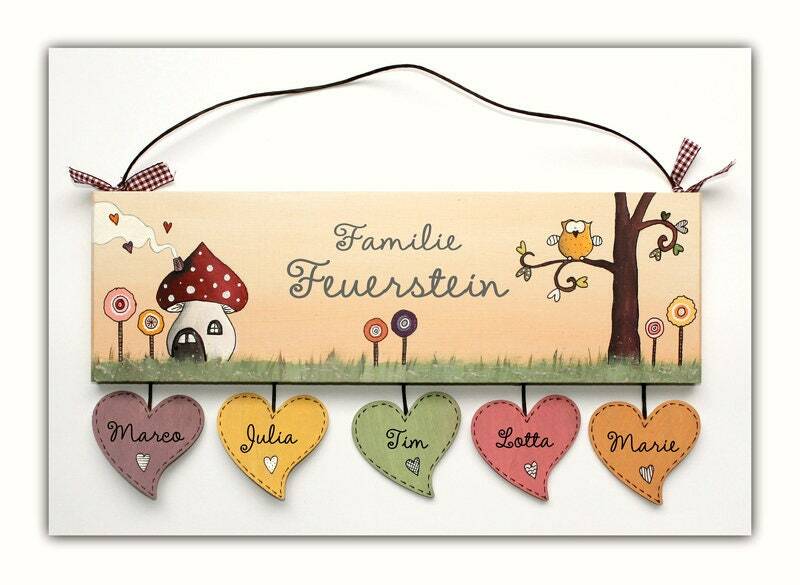 For example: Family current to four, montage of 5 Hearts: Papaname-mamaname-daughter name-&-Sonname. In position 4, a heart is labeled with A & sign. This heart can then be replaced later by another heart. However, individual hearts can also be ordered and found in our shop department "accessories". Placeholder hearts can also be painted with symbols for luck or love, i.e. clover, horseshoes, Hearts, Sun, star, flowers etc. Also conceivable would be sun-papaname-Mamaname-sonname-Sun. The possibilities are almost unlimited. The paint/lettering is provided with clear lacquer (Matt) and is protected against atmospheric influences as best as possible. Super schön ❤️ gerne wieder!